Dh'fhàg sia itealain Typhoon ionad RAF Inbhir Lòsaidh airson a dhol an sàs san iomairt-airm an aghaidh na Stàite Ioslamaich ann an Siria. Dh'fhàg na h-itealain an t-ionad ann am Moireibh mu 08:00m 's iad a' dèanamh air ionad RAF Akrotiri ann an Cìopras. Bhòt 397 Buill-Pàrlamaid ann an Taigh nan Cumantan oidhche Chiadain airson na h-iomairt airm an aghaidh IS a leudachadh bho Iorac gu Siria. Thòisich ionnsaighean le itealain Tornado stèidhichte ann an Cìopras uairean de thìde an dèidh na bhòta. Dh'fhàg Airbus A400M ionad RAF Inbhir Lòsaidh cuideachd. Bha i sin a' giùlain uidheamachd agus innleadairean 's luchd-obrach a bhios ag obair air an talamh agus a' coimhead às dèidh nam plèanaichean a tha stèidhichte ann an Cìopras. 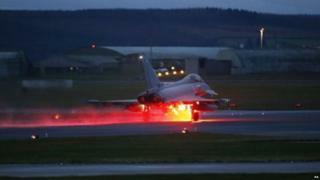 Chuirear dà itealan Tornado a tha stèidhichte aig ionad RAF Marham ann an Norfolk a Chìopras cuideachd. Na bu thràithe chàin an SNP buil bhòt Thaigh nan Cumantan air na h-ionnsaighean. Thuirt Ceannard a' phàrtaidh ann an Westminster, Aonghas Robasdan, a tha na Bhall-Pàrlamaid airson sgìre Mhoireibh, gun deach Alba a dhraghadh a-steach gu cogadh gun ro-innleachd air ciamar a gheibh i às. 'S e dìreach dìthis den 59 de bhuill na h-Alba a chuir taic ris na h-ionnsaighean: an Lib-Deamach Alasdair Mac'IlleMhìcheil agus an Tòraidheach Dàibhidh Mundell. Tron deasbad sna Cumantan, a mhair deich uairean de thìde, thuirt am Prìomhaire, Dàibhidh Camshron, gur e "uile-bhèistean bho na meadhan-aoisean" a bh' ann an IS, gun robh iomairt airm nan aghaidh laghail agus "gun cumadh e an dùthaich againn sàbhailte".